This is for all you pizza lovers. While I was compensated for this post, all thoughts and opinions are my own. I may not have shared this before but I suffer a particularly sad problem of not being able to eat regular pizza. I’ve tried tons of different tomato sauces and none of them sit right with my system. So, instead, I go for white pizzas or sometimes a bbq pizza. Right now, I am totally in love with this amazing crab pizza. 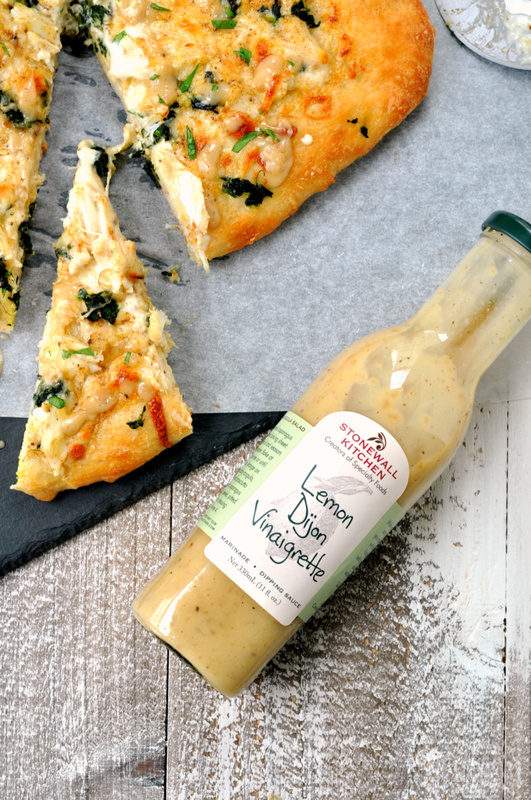 This pizza is a combination of all the amazing things you can wish for on a pizza: creamy sauce, crab meat, spinach and, of course, cheese. I also drizzle it with lemon Dijon vinaigrette at the very end for a little bit of tang to cut all the creaminess. It is the perfect finishing touch for this pizza. 1. Preheat oven to 425 degrees. Line a baking sheet with parchment paper and place pizza crust on top. Bake in preheated oven for 10 minutes. Remove from oven. 2. Spread pizza sauce onto partially baked crust. In a small bowl, mix together crab meat and Old Bay seasoning. 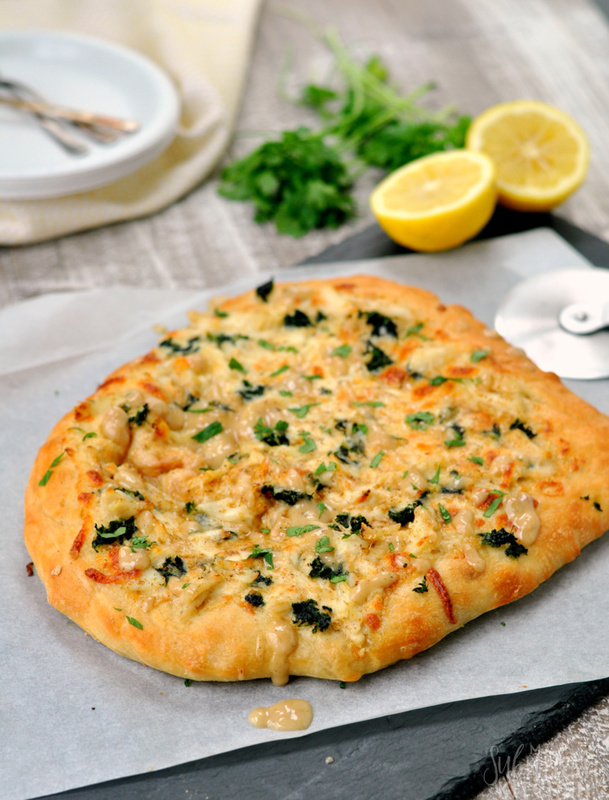 Top pizza with crab meat, spinach, mozzarella cheese and Parmesan cheese. Bake for 15 minutes or until cheese is bubbly. Remove from oven and drizzle with vinaigrette. Even my regular pizza lovers are always begging for a slice (or two!) 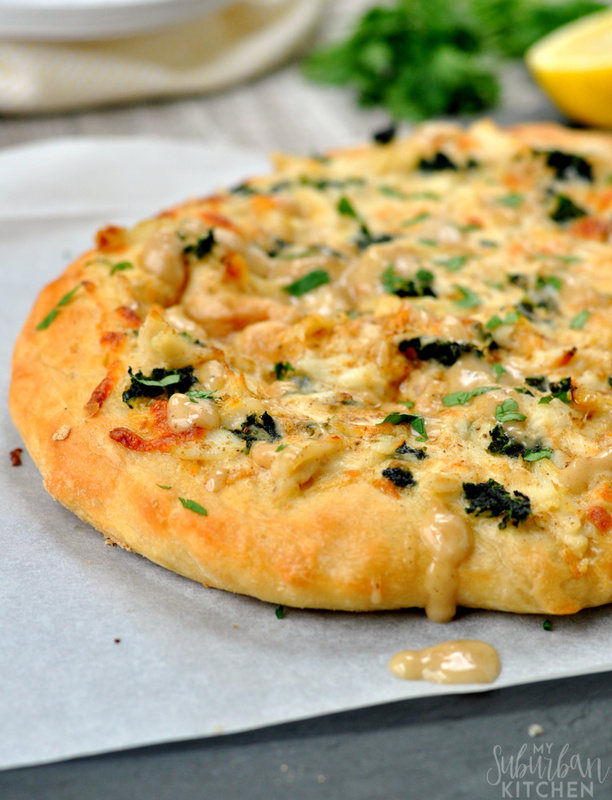 of this amazing creamy crab pizza. I always make sure I have the ingredients on hand when we are planning a pizza night so I can join in too. What are your favorite pizza toppings? Do you like to experiment with different sauces and additions or stick to regular tomato sauce and cheese? Preheat oven to 425 degrees. Line a baking sheet with parchment paper and place pizza crust on top. Bake in preheated oven for 10 minutes. Remove from oven. Spread pizza sauce onto partially baked crust. In a small bowl, mix together crab meat and Old Bay seasoning. 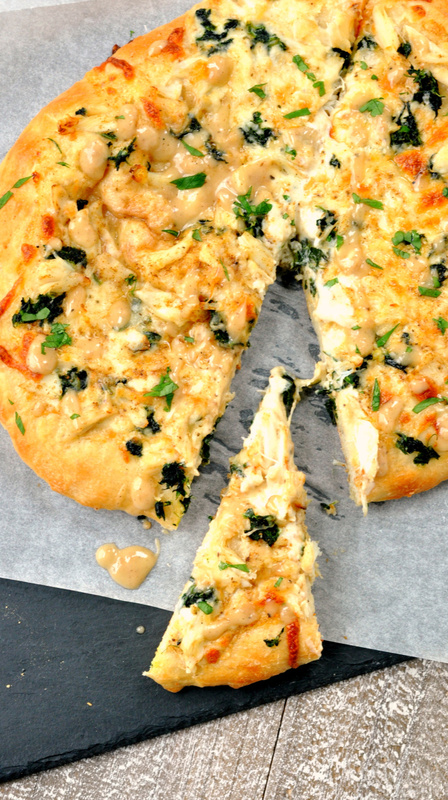 Top pizza with crab meat, spinach, mozzarella cheese and Parmesan cheese. Bake for 15 minutes or until cheese is bubbly. Remove from oven and drizzle with vinaigrette.